On Monday we took Murphy up the school, he is still being placid and lovely and gorgeous – thank goodness. He was doing really well with his walk/trot and canter transitions and is definitely straightening up so he got the opportunity to show off his jump. 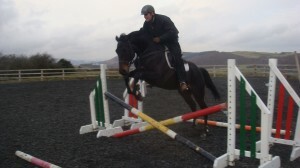 First we did some trotting poles which he took on really well so we upped the anti and jumped a cross pole. 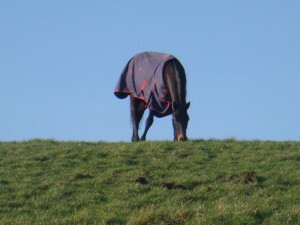 Check out the picture (excellently photographed if i say so myself) what a star! 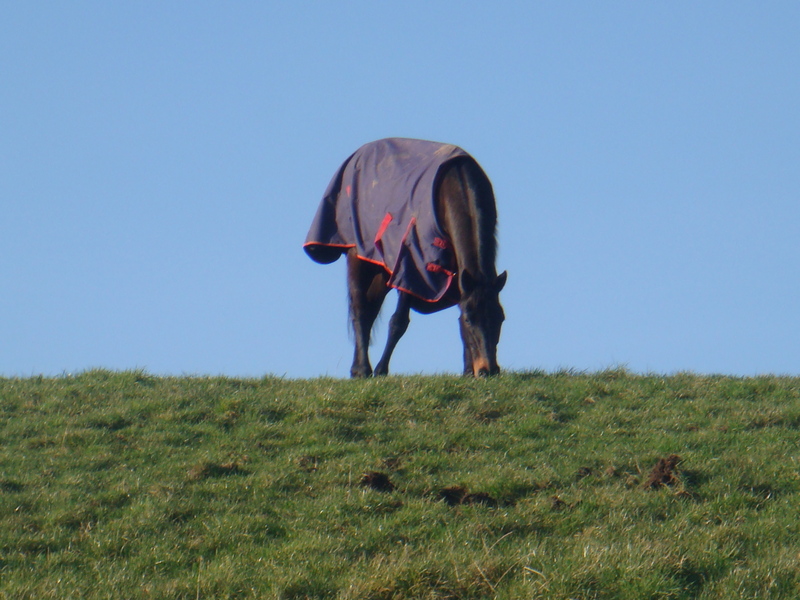 Murphy has been up and out early every morning this week, this morning he was almost out at work in the dark. He thinks this is a fab start to the day (but was not so impressed this morning when he realised that it meant having his breakfast late). He is working well and the long Winter nights mean that our little stallion has calmed down dramatically and is an absolute pleasure to work with. 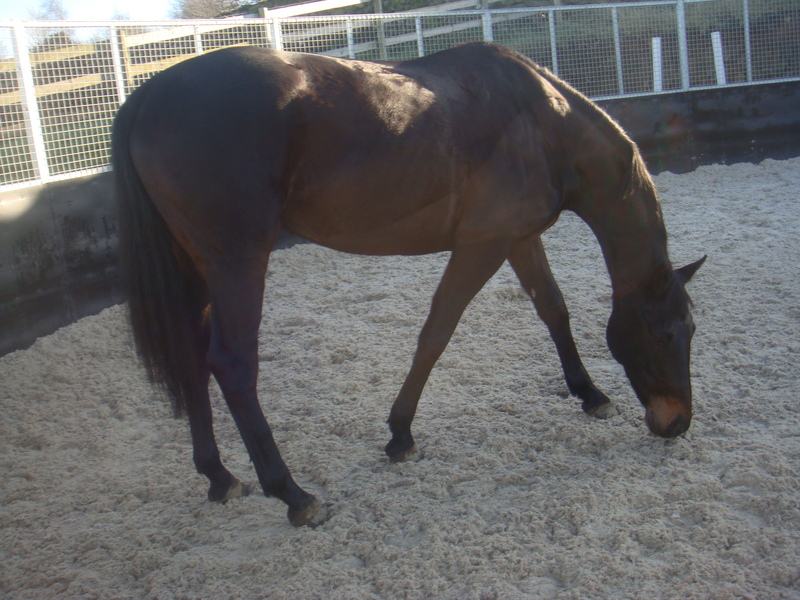 He is much straighter now in both walk and trot than he was and his canter is coming along brilliantly. He had a small mishap on Sunday when he tripped over and ended up with a bust lip but being the little trooper he is he was straight back up. The same can’t quite be said for Matthew who promptly went straight over his ears (unsurprisingly) and heard his leg (he thinks he might have been stood on), his shoulder (he fell off onto the fence) and his finger (no idea how that one happened) and was walking like John Wayne for a good 24 hrs – not good. Lets see if he can continue with his early starts. This week has been horrendous weather, freezing cold and the snowy yard became a skating rink. 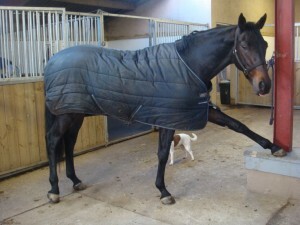 Exercise therefore has been minimal and so Murphy has had to practice his yoga instead! On Friday we packed our spades and set off to the beach. Murphy was extremely excited (perhaps some of this might have been because he was travelling next to the Mare!) and couldn’t wait to get there. 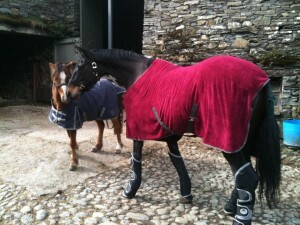 In total 2 horses and a pony went to Roanhead on a breezy but dry day, it was excellent fun from the moment we arrived. 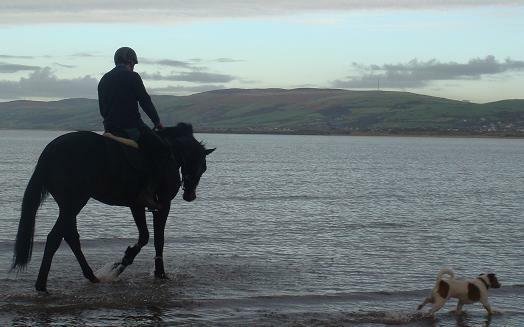 The horses were not too keen to get down onto the beach as the ground was a bit on the soft side and rather nerve racking for a youngster like Murphy. Next came the water! Murphy has never seen water on such a grand scale before but tackled it like a man (not particularly well) and made it in eventually! There have recently been some new additions to the yard and on Sunday Murphy was to meet the first one. 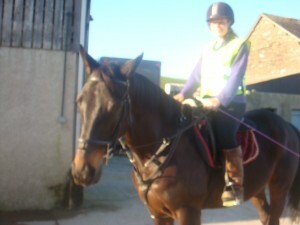 Up in the school he was busy working on his trotting poles with Matthew and doing well when in came a new horse. We were so proud of Murphy because despite what would usually have been a massive distraction he managed to keep his focus on the job in hand. He worked well with not too much dancing about and made good progress. He was in fact so good that the collecting ring is next! The smallest of our 2 stallions Murphy has been progressing well and so on Sunday went out for his first trip in the brand new wagon and he loved it! Despite the torrential rain battering down above his head he travelled well and was surprisingly easy to load and unload. 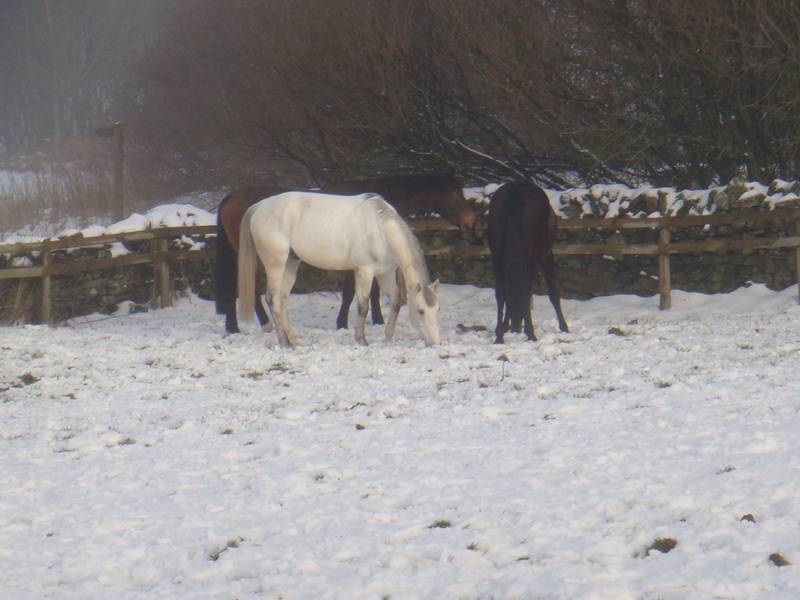 After the short journey we arrived at the neighbours stables and took Murphy into their school (aka our show) – thank you very much for the loan. He was a little flighty (but it was cold and wet) but seemed to find his feet well. This was however, Murphy’s first introduction to mirrors (and these were BIG mirrors) he spent alot of time up that end of the school prancing about, we’re not sure wheter he was thinking ‘my what a handsome chap’ or ‘I’m going to kill that other horse’ but it made interesting watching! 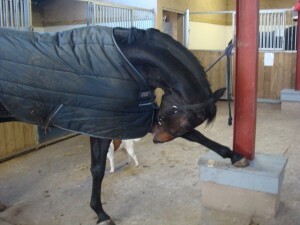 He finally settled down and tackled some trotting poles sucessfully managing them carefully and accurately – what a star! The next thing to concentrate on is travelling in a straight line which seems difficult for Murphy but we’ll get there. The next trip out is going to be the beach so watch out for Sand Castle Building!